Over the past couple years the Author Earnings Report has become one of the leading studies of the ebook market. Its quarterly report on the Kindle Store on Amazon.com offers a unique snapshot of the world's largest global ebookstore, and now the pseudonymous Data Guy and his horde of algorithms, spiders, bots have turned their attention to a second branch of the Kindle store: Amazon.co.uk. The UK is far from the largest book market in the world; in fact, it is estimated to rank 5th behind US, China, Germany, and Japan. But in terms of ebooks, the UK has benefited from being the first country with a local Kindle Store, making the United Kingdom currently the world’s second largest market for digital books. And since Amazon dominates the UK ebook market just like the US ebook market, that makes Amazon.co.uk the second largest retailer of English-language ebooks in the world (until India takes off, that is). So naturally we're all curious to get a new perspective on that market. The full report, which can be found on the Author Earnings website, looks at ebook pricing, market share by publisher class, the prevalence of ISBNs, and the overlap between the UK and US best-seller lists. Here are a few of the more interesting details. As you can see, Amazon's publishing imprints are having somewhat better luck in the UK than in the US (15% vs 13%), possibly due to the data being collected on 6 November, 5 days after Amazon gave away the November freebies. The Big Five are selling a similar sale of ebooks in the US as in the UK, while small medium publishers are doing somewhat better in the UK than in the US (24% vs 19%: does this raise the possibility that Big Five have an expansion opportunity in the UK?). Indie authors are doing worse (26% vs 38%), possibly because they're averaging a higher price in the UK than in the US. 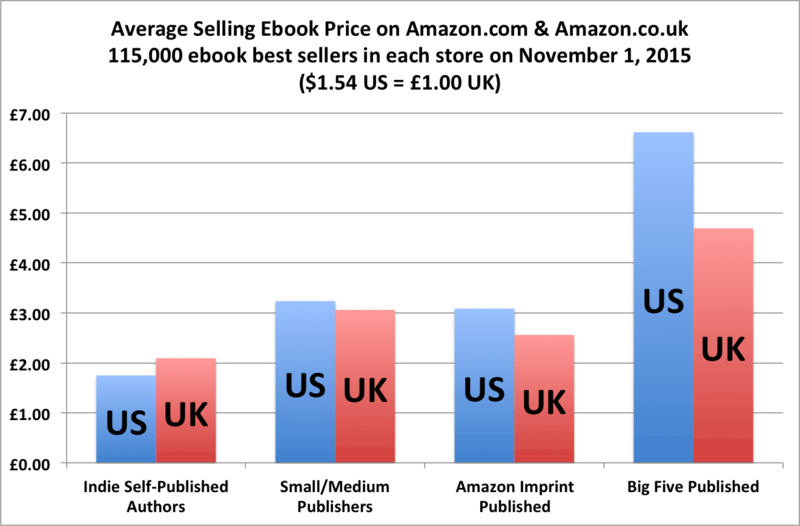 Two details worth noting is the higher priced indie ebooks, and the disparity in Big Five ebook prices in the US and the UK. Apparently the UK divisions of the Big Five aren't following their US siblings into agency and ever increasing prices. At this point the Big Five's higher ebook prices in the US appears to be affecting its ebook market share, but it's hard to say of the lower average price in the UK is having a net positive effect (I want another report from the UK before drawing any conclusions). It's too early to predict how the different pricing policies will affect the relative shares, but this is definitely a detail I will be watching for in the next report from the UK. And that's just a tithe of the report, which is too long to go into in a single blog post. You can find more information on the Author Earnings website. Going to be honest, US pricing policy is ridic. England makes good use of other English speaking countries’ literature, like USA. They’re also all on an island, living off of import, because they don’t export anything. And on such small island, where space is small, it’s only Natural for them to go digital, information wise, since it doesn’t cost a thing. Nielsen’s report on the Indian Book Market (Oct 2015) cites it as pushing the UK into sixth place. As witness HarperCollins’ Bookperk UK newsletter, 0.99 and free ebooks from HarperCollins are offered pretty much every week.so no surprise that they are doing well. One issue for US indies in the Kindle store and elsewhere is that they tend to set the US price and copy that across to other countries, without realising that 2.99 USD is a lot less than 2.99 GBP or 2.99 euros. Dude, it’s mostly not US pricing policy so much as corporate pricing policy. Where corporations can’t price their products egregiously, it’s generally because they’re by law prohibited to do so. Doesn’t the EU have pretty significant oversight of digital pricing across the board? I thought I remember having read that.